Richard Playle MSc, our Managing Director, has been involved in the insurance and risk management of thatched and period properties for more than 35 years. 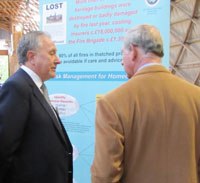 In 1994, as marketing director of CGA Insurance brokers, the largest thatch insurer in Britain at the time, he helped fund and took an active part in ground-breaking research by RHM Technology into the causes of thatched property fires. 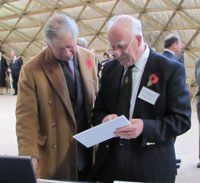 The project was eventually sponsored by the then Department of the Environment under a “Partners in Technology” scheme, scoring an unprecedented 18 out of 20. The results of the research have since had a major impact on thatched property insurance in the UK and the methods used to protect them from the ravages of fire. Richard’s continuing passion for the care and repair of our built heritage led to his study and award of a Master of Science degree in building conservation from Bournemouth University in 2006. 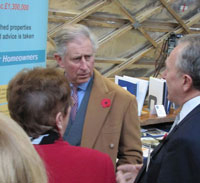 Here he is, in conversation with HRH The Prince of Wales at a 2010 thatching event organised by the National Society of Master Thatchers, where the prince showed considerable concern at the number of thatched properties lost annually through fire, and offered tangible support to the efforts being made to reduce it. Bang! Graphics | Print | Web Design | Southend | Essex Playle Russell Special Risks Thatchline is an online trading style of Playle Russell (Special Risks) Ltd. All Rights Reserved. Registered in England (No: 03779860) Playle Russell (Special Risks) Ltd is authorised by the Financial Conduct Authority.